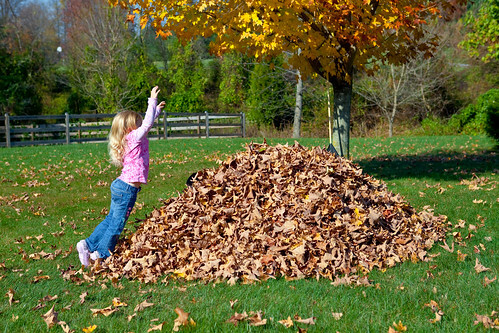 Eco-Friendly Approach to Fall Clean Up | What's Green with Betsy?!? Thank you Betsy! I was raking today, thinking about how silly it seems to collect leaves for recycle trucks when they are natural mulch and fertilizer/ Since my neighbors wouldn’t appreciate my leaves blowing all over their raked yards, I rake mine too. However, I don’t use bags of any kind.. I pack barrels and they get emptied into the truck. I have seven large barrels and I fill them several times (the recycle truck comes every week for six weeks and I always have them out there). When I am not using the barrels (which is the whole rest of the year) I stack them one inside the other and put them in a corner of my garage. I avoid stand plastic bags of any kind and can’t see wasting paper either if I can help it. Thanks for providing this forum to chat about these things! Thank you Betsy! Thanks for the great tips. I was raking today, thinking about how silly it seems to collect leaves when they are natural mulch and fertilizer. Since my neighbors wouldn’t appreciate my leaves blowing all over their raked yards, I rake mine too. However, I pack barrels and they get emptied into the truck. I have seven large barrels and I fill them several times (the recycle truck comes every week for six weeks and I always have them out there). When I am not using the barrels (which is the whole rest of the year) I stack them one inside the other and put them in a corner of my garage. Thank you Starr for commenting and for providing such good information. I didn’t know recycle trucks pick up leaves too, and barrels make much more sense than plastic bags. I will add that to my post. Thanks……. I mulch my leaves by mowing right over them. Although I do use the gas mower, in the long run I think it more environmentally sound and sure is easier than raking & bagging. We have a wonderful yard waste program here in San Jose. I compost as much as I can, but we can leave a pile of yard waste at the curb on pickup day. One truck grabs the waste between two massive grabbers, then empties it into another truck. It’s made into compost and you can then buy it directly from the city by the truckload. My Chinese Pistache drops small leaves, which I scoop up and use directly in a nearby flower bed. Isn’t nature grand? Thanks for letting me know. I’ve been hearing from other readers about what their towns are doing with fall leaves. It’s encouraging to hear about real progress like this. Good to hear from you! I meant to tell you that you do a great job!!! And wonderful to walk with you! Thank you Dorothy! I appreciate your kind words! I loved that walk and look forward to doing it again!! !